In this Tuesday, Nov. 21, 2017, photo, director Zac Manuel confers with videographer Bruno Doria in front of a statue of an African-American "Everywoman" near the pedestal that once held a statue of Jefferson Davis in New Orleans. Manuel is creating a video for the title song of singer and civil rights activist (right) Mavis Staples' latest album, "If All I Was Was Black." A black woman approaches the pedestal that once showed off the Confederacy's first president and finds a statue that looks like her. A pair of hands appears atop the pedestal of a toppled North Carolina monument, as if an African-American is about to climb up and replace the statue of a Confederate soldier that once stood there. 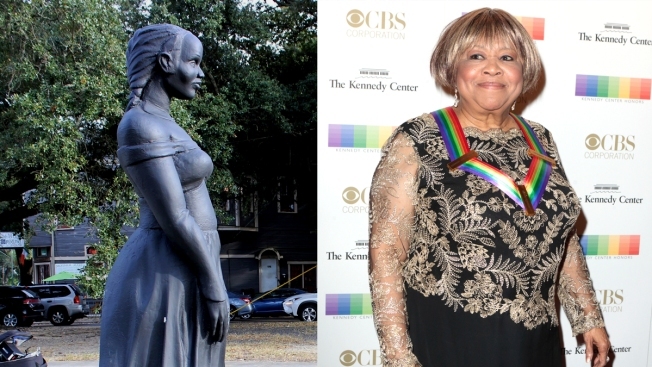 These scenes are part of a video to be released in December, repurposing the pedestals that once held Confederate monuments for a song by singer and civil rights activist Mavis Staples , who finished a tour with Bob Dylan earlier this month. The song, "If All I Was Was Black," is the title track for her latest album. The lyrics by producer and Wilco guitarist Jeff Tweedy include "If all I was was black / Don't you wanna know me more than that?" Though Staples is 78 years old, her alto voice remains strong, vibrant, smooth and nuanced. Filmmaker Zac Manuel said he made a documentary as the New Orleans statues came down, interviewing "Confederates from Arkansas" who wanted the statues to stay on view. He said he was astounded by "the amount of vitriol and anger there was about taking them down, and the weird and dismissive stories people believed in as to why they should be venerated. These spaces were burned into my head as something really negative, and I wanted to change these spaces to something positive for blacks — which they had never been before." Manuel said he was recommended to Staples' manager by a mutual friend in the music business. The manager asked for proposals, and this one was accepted. He said he wanted to show figures of everyday, underrepresented people. The foam statue created by sculptor Gabriel Wimmer for the pedestal that once showed Jeff Davis in mid-oration is an "everywoman" for African-Americans, he said. "I wanted it to be representative of — in this case — black women. Black women, I think, are very under-represented in society, historically and contemporarily," he said. Manuel filmed Staples in Durham, North Carolina, before she began the tour with Dylan in October. New Orleans scenes include video of a black man riding a white horse on the circular walk around the base that once held an equestrian statue of Gen. P.G.T. Beauregard. Another shows a black man in a hoodie apparently dangling his legs from the 60-foot pedestal that once held a statue of Gen. Robert E. Lee, then kneeling and rising to stand tall. The scene on Lee's pedestal is created through cinematic trickery. "The whole idea is to play with these notions of contemporary symbols and convert them into something else — something positive. People are afraid of a black guy in a hoodie, so why not put him 60 feet in the air?" Manuel said. As one white man passed by the foam statue on Jeff Davis' pedestal, he said, "It's a lot better than what used to be there."